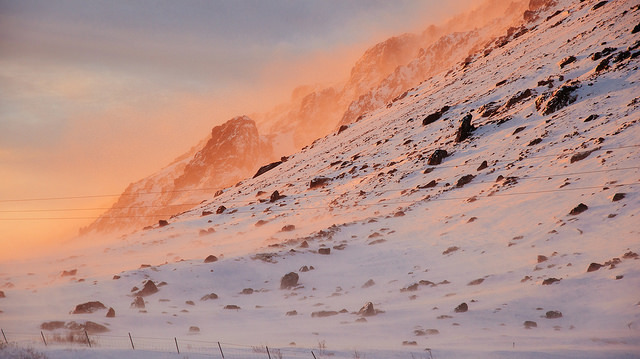 Photo essay: A winter wonderland in Iceland. When I decided to spend some time in the cold white north this winter, many people thought I was a bit crazy. 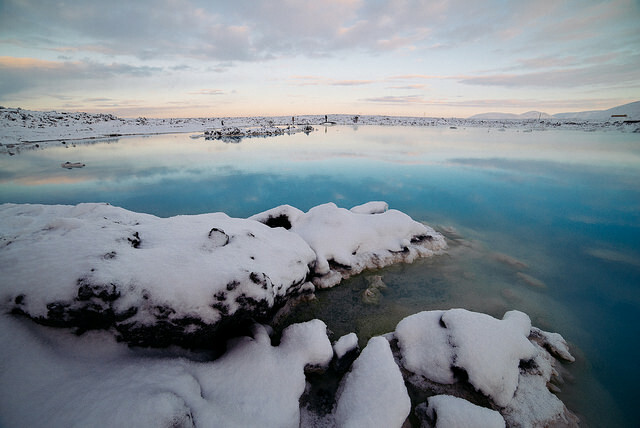 Iceland is undoubtedly a beautiful place, but its winters host a bounty of winter storms and very few hours of sunlight. Naturally, I still booked the trip and even convinced a friend to come with me. And upon reflecting on the experience, I don't doubt my decision one bit. 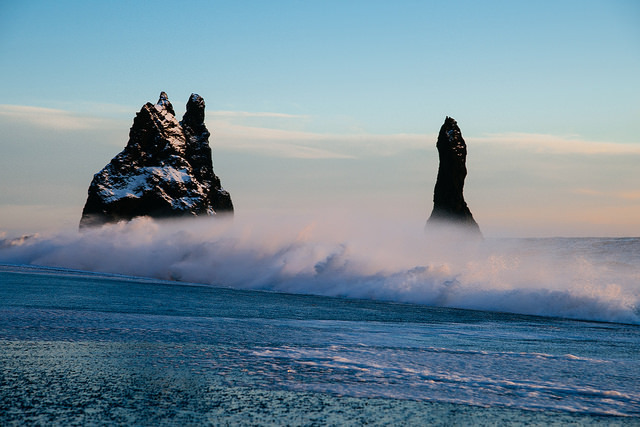 Iceland is home to many interesting foods and extraordinary views. The country has just over 325,000 people residing there, making it one of the most sparsely populated countries in Europe. Most of the population lives in Reyjkavik, the country's capital. Other major cities are located along the country's coastline, as the interior is full of uninhabitable lands and lava fields. 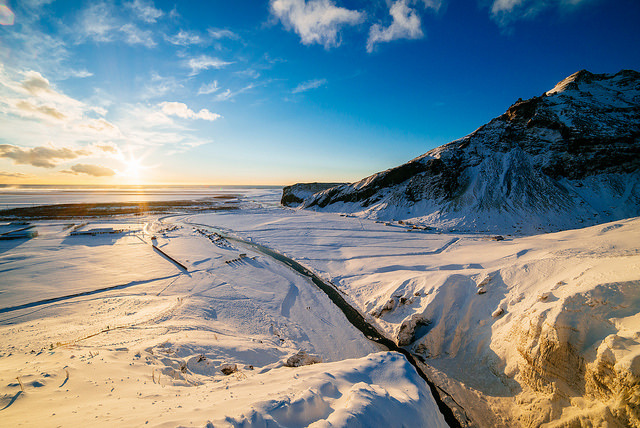 You may recall the volcanic eruption in March 2010 from the volcano called Eyjafjallajökul in southern Iceland, which delayed European flights for weeks. As a vegetarian, many of the food options simply weren't meant for me. Amongst some of the traditional foods were minke whales, fermented shark, and puffins. All three meat options sounded horrible to me, but then again, I'm pretty biased. George eat reindeer soup on our first night in, which I was told was "just okay". (Note: Kids, if you're wondering why you didn't get what you asked for from Santa this year, it's probably because he's losing his mode of transportation to the food demands in Reykjavik and had to make some budget cuts to compensate). George and I also spent some time along the Ring Road that goes along the circumference of the country. It's a long road - it would take at least a week or two to get around it and see all the sights. We spent a day from dawn until dusk exploring the plentiful sights and sounds along the southeast section of the road. 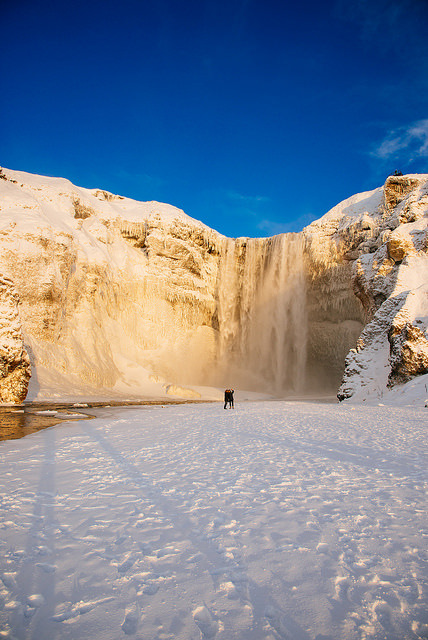 This waterfall (the suffix "foss" means "waterfall" in Icelandic) was a small but powerful being. Its actual downpour looks quite small, like poyuring tea from the kettle. But it's 60-metre drop meant that its impact was forceful, All benches and railing were covered in slippery ice due to the abundant cold mist that sprinkled my face as I approached. This foss was the mother of the fosses we saw that day. I grew up close enough to Niagara Falls, Ontario to know what big waterfalls looks like, but this one was certainly a sight to see. 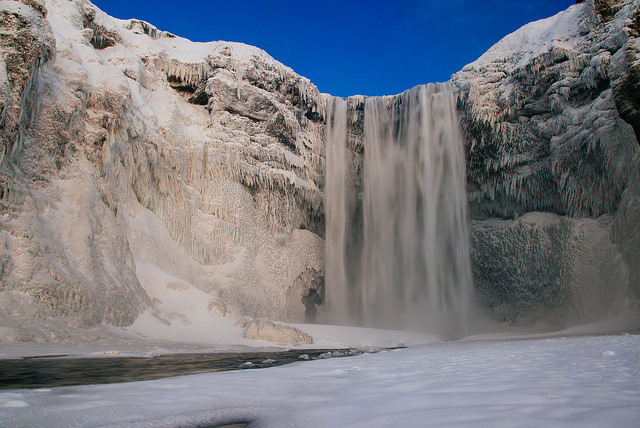 With the snowy white ice and the sound the force of the water made upon impact, it made for an impressive experience. We went from the bottom of the waterfall to the top with a few sets of stairs. The lookout was breaktaking - you could see the Atlantic Ocean with the low-hanging sun in the horizon. Since it was usually dark out, I had chosen to bring my brightly coloured orange jacket. It proceeded to ruin most of the shots I was in. 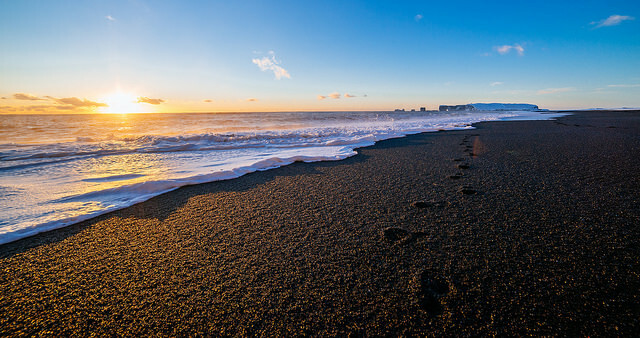 Have you ever seen sand that was all black? 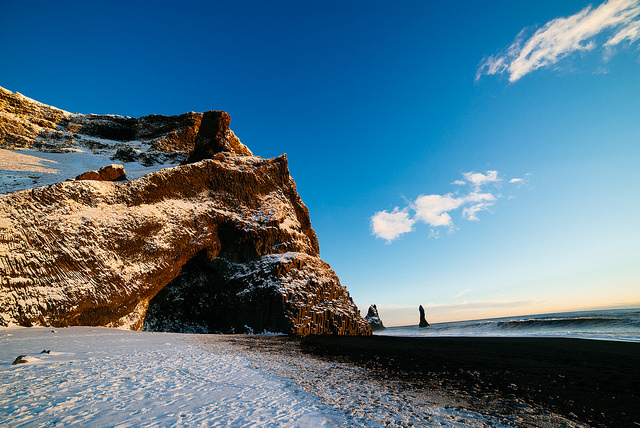 I hadn't until I went to this beach just down the way from Skogafoss, nestled near the town called Vik. The sand was pebble-sized - perfect for improving my rock skipping skills. The beach had giant waves that crashed upon the black shore and broke immediately upon impact. There was even a small cave with big icicles hanging from its roof. 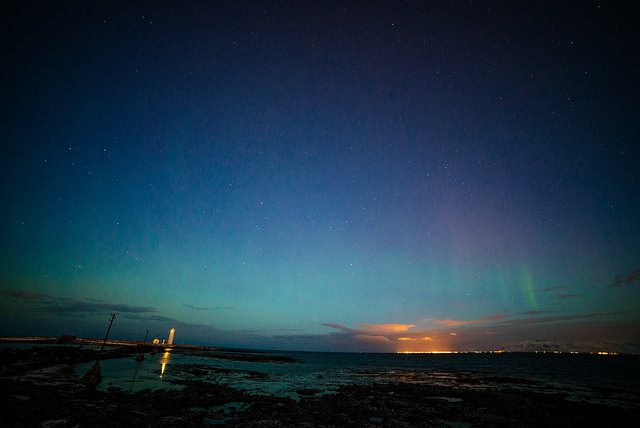 Iceland is in the perfect spot for seeing the northern lights. But for anyone who's tried to chase this evocative light show, you'll know there's a few variables that have to align perfectly. Firstly, there can't be any cloud cover. Secondly, it has to be the season for it - usually winter-time is best, but others have seen northern lights outside of the November to April window. Thirdly, you've got to be patient - they can come and go in the night sky and just because you can't see them in the moment doesn't mean you won't see them in a few hours. 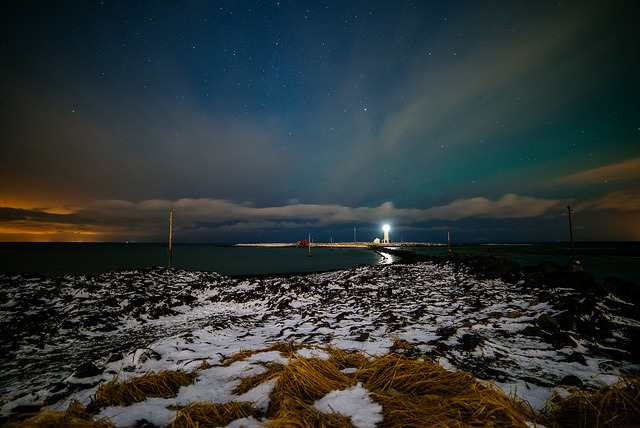 Grotta Lighthouse in December turned out to meet all three of those conditions. 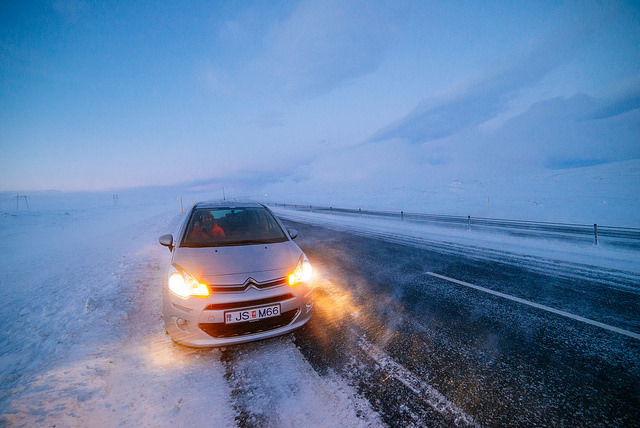 It's actually just outside of downtown Reyjkavik - it only took us 15 minutes to drive there from our downtown hostel. It was far enough to not be subjected to the downtown core's light pollution and lent itself to some amazing views. George and I had tried one night and had seen a little showing. But since the sunlight in Iceland runs from about 11am-4:30pm, we just decided to go to bed and wake up early in the morning to try again. It (faintly) worked. Iceland reminded me of why I love spending time outside. The temperature was frigid and the combination of jetlag and lack of sunlight made for some tricky timing, but what we got in return was astounding and rewarding. It showed me what pristine areas can look like and reminded me about the recreational and cultural reasons for why protecting nature is detrimental to the healthy and thriving ecosystems we live in. It invigorated and inspired me to reconnect with the natural areas around my own Canadian community - and I hope these pictures do the same for you. All photo contributions from George Kamiya. City as space, space as phenomenon.